Proteins are long strings of amino acids jumbled together like earphones left inside of a pocket for too long. But while a protein’s mess of intertwined knots may look haphazard, their specific folds are extremely important to their biological functions. Misfolded proteins are thought to be the genesis of diseases such as Alzheimer's, Parkinson's, Huntington's and cystic fibrosis, just to name a few. To get a detailed look at how different proteins are folded, researchers freeze them in a crystalline structure and bombard them with extremely short bursts of x-rays. By recording how the x-rays bounce off the samples, scientists can reconstruct the different shapes—or conformations—that a protein can take. They then use a variety of techniques to determine how the proteins fold themselves into their final structures. But there are limits to these techniques that have caused most studies to focus on smaller, simpler proteins. The average protein found within a human cell, however, is neither small nor simple. Most are more like an economy-sized box of Christmas lights that have haven’t been opened in a decade. The results, to be published in the September 9, 2016 issue of the Journal of Biological Chemistry (online on July 4, 2016), show that biochemists need to start rethinking some of their assumptions. Traditional methods for determining protein structures and stability average results from hundreds, if not thousands, of individual samples. While this may give more reliable results, it misses stable conformations that don’t take shape very often. One end of the protein is attached to a stationary object. The other end is attached to a flexible sliver of glass that is sharpened to a point all the way down to the atomic scale. As the glass slowly pulls on the molecule, it bends from the resistance of the protein’s bonds before snapping back into place when the bond breaks. 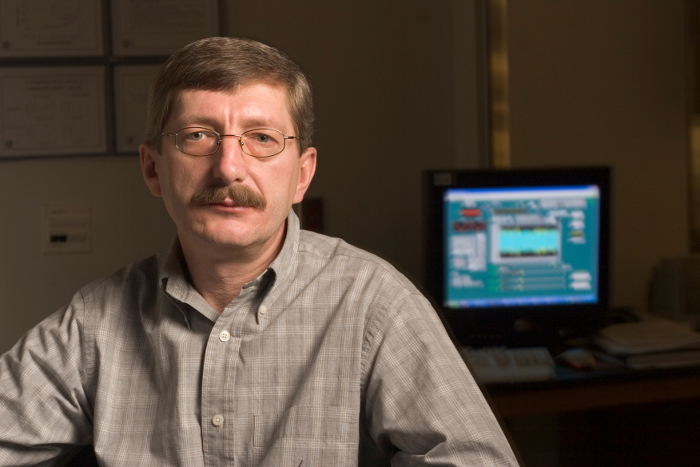 To discover this second conformation, Scholl worked with his other advisor, Weitao Yang, professor of chemistry at Duke, to run computer simulations that could explain the data. They discovered that one-half of the protein, called a domain, was gaining stability from the other—a phenomenon that had never been seen before. The protein is, however, extremely similar to many other proteins found throughout the animal kingdom. In mammals, including humans, it bears a striking resemblance to a protein found in our eyes’ lenses. These proteins are extremely stable, not having to be replaced for years or even decades—a far cry from others that are replaced on a daily basis. This work was supported by the National Science Foundation (GRFP 1106401, NSF MCB-1052208, MCB-1517245) and the Katherine Goodman Stern Fellowship from the Duke University Graduate School. “Single-molecule force-spectroscopy reveals the calcium dependency of the alternative conformations in the native state of a bg-crystallin protein.” Zackary N. Scholl, Qing Li,Weitao Yang, and Piotr E. Marszalek. Journal of Biological Chemistry, 2016. DOI: 10.1074/jbc.M116.729525.